When you think, “Advantage Bridal” don’t think only bride stuff, oh no it’s SO much more. 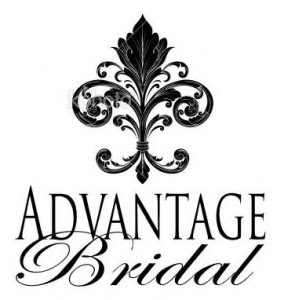 Advantage Bridal covers weddings, baby showers, birthdays and everything in between. They specialize in personalized gifts, such as clothing, baby products, birthday gifts, you name it. If it can be personalized, Advantage Bridal makes it. I was shocked by the amount of inventory they carry on their site. It’s almost like a Party City but ten times better, and a much nicer selection. If you’re hosting a party for someone special, Advantage Bridal is sure to have the perfect decorations, invitations and party favors. I was of course drawn to their baby shower products and of course their adorable baby gifts. They carry baby jewelry, blankets, clothing, totes, ornaments, gift baskets, the list is too long to mention! I noticed they carry baby shower party favors that I haven’t seen on the internet or in any party store yet. Their site gave me many more ideas on what I could for my baby shower coming up. Have a tote personalized with anything you want! 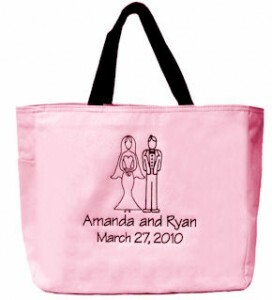 I really liked this bag for a bride to be, (or a newly wed) so adorable! Having a bachelorette party? 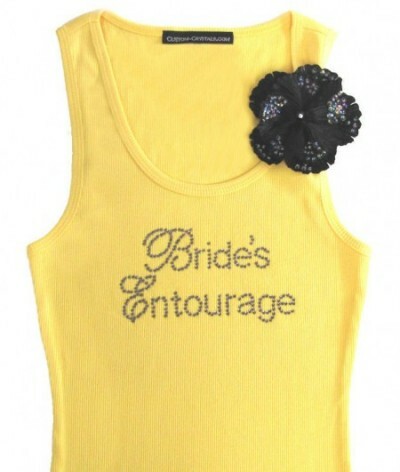 Advantage Bridal can make all your custom tops, I love this one for the adorable flower on the shoulder. And my favorite from Advantage Bridal? 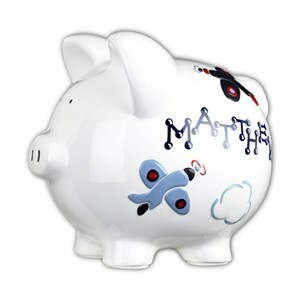 The personalized baby piggy bank! You start off with an adorable little piggy, and then you pick the name you want on the side, the font, and three different colors of your choice. Add a bow to make your piggy look even more adorable. I can’t stress the quality of this little bank. I had one made for my baby, and I will treasure it forever. Although the nursery is not yet completed, this beauty will sit on the dresser and I like to think of it as one of her very first personalized baby gifts! Isn’t she the cutest little piggy? I love the different pinks and the front ribbon! Advantage Bridal can personalize a little piggy for you too, click here to visit their site and start your own creation! And if you’re not in the market for a baby bank, I’m sure you will find something else gorgeous for Advantage Bridal to personalize, or purchase one of their already made products. Buy: Visit Advantage Bridal for baby gifts, wedding favors, party invites and much much more! The Giveaway: One winner will win their own personalized piggy bank. Pick your own colors, name and adorable bow! ($35 value!) To enter, enter with the Rafflecopter below.